Liverpool striker Mario Balotelli took to his Instagram account to express his frustration at being flagged offside in the FA Cup semi-final defeat to Aston Villa on Sunday. Trailing 2-1 in the dying moments, a long pass from Steven Gerrard over the top freed the Italian but the linesman’s flag went up, which was later revealed as the wrong decision. Should the play remained uninterrupted, Aston Villa defender Jores Okore may have prevented the shot Balotelli had, which eventually ended up in the back of the net. Liverpool manager Brendan Rodgers seemed desperate when throwing on Balotelli at half-time given that he has clearly been out of favour for the majority of the season. Signed from AC Milan last summer, it remains to be seen whether or not he’ll remain at Anfield beyond the next transfer window. Balotelli has scored one league goal all season and despite the trepidation surrounding his move, nobody could’ve predicted that the situation would be this disastrous. Here is Balotelli’s comment on Instagram. No words. This picture say it all ????. 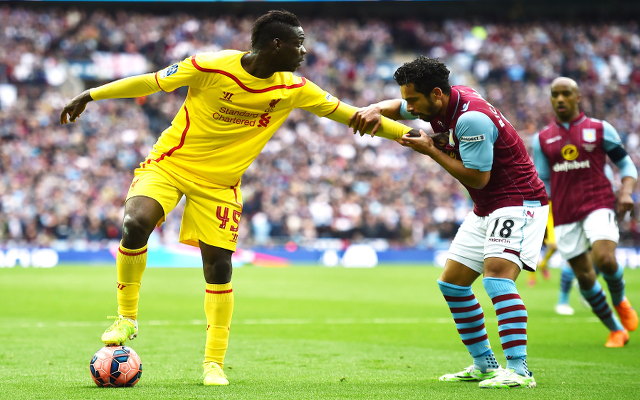 (Congratulation to Aston Villa) anyway.. And guys HEAD UP we are Liverpool and YNWA expecially when we lose ??? ?